Now we get to another one of those extremely successful, arena-filling, electronica albums. From the first track you can tell why, this is very attractive music indeed, particularly in a particular setting. It is this dependence on setting that makes this album not all that amazing to listen to at home, it is something that needs to be experienced where it is meant to be experienced, the club or live event. The fact that a certain electronica club culture has dwindled in the past decade has unfortunately dated the album, it is very late nineties. While it has a handful of tracks that are enjoyable in their own right, as an album it does not maintain the promise of its first track. 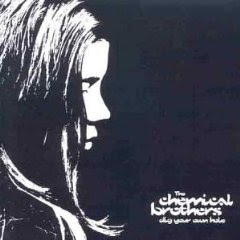 In 1998 Q magazine readers voted Dig Your Own Hole the 49th greatest album of all time. In 2000 the same magazine placed it at number 42 in its list of the 100 Greatest British Albums Ever.